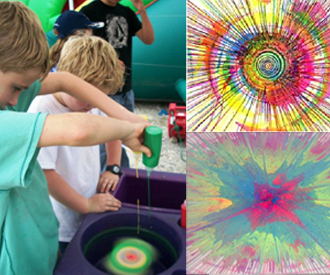 Kids will have a blast making their own tie-dye artwork! Our spin art game comes complete with the paper and different paint colors. Drip your paint right onto the spinning canvas to make your own unique masterpiece. The spin art machine is user friendly and the spinner sits low enough so the paint won’t fly out of the unit. The Spin Art Game is great for birthday parties, school carnivals, religious festivals, church fairs, summer camps, daycare activity days and company picnics!